A cognitive scientist who studies why people choke under pressure and how to fix it. 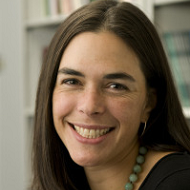 Sian L. Beilock is a professor in the Department of Psychology at The University of Chicago. Her research program sits at the intersection of cognitive science and education. She explores the cognitive and neural substrates of skill learning as well as the mechanisms by which performance breaks down in high-stress or high-pressure situations. Dr. Beilock’s research is funded by the National Science Foundation and the U.S. Department of Education (Institute of Education Sciences). Her book, “Choke: What The Secrets Of The Brain Reveals About Getting It Right When You Have To” came out in Fall, 2010.